I remember very clearly when and where I first discovered Nick Cole’s writing. It was a Summer’s day a couple of years ago, and I was sitting in a park in Vancouver, looking for a book to read on my Kindle. I spotted Nick Cole’s The Old Man and the Wasteland and it sounded like a good way spend the afternoon. I was hooked right from the start, read it in one sitting and loved it. More recently, I read Soda Pop Soldier and just couldn’t put it down. 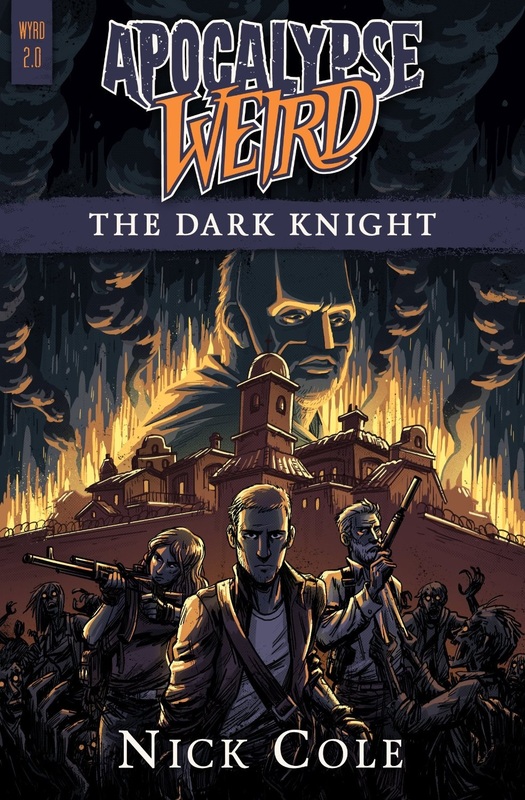 Now, I’m reading his second Apocalypse Weird title – The Dark Knight, the sequel to The Red King, and it’s another great book. Hi Nick, welcome to the site. Tell us a little bit about your latest Apocalypse Weird book, The Dark Knight. Basically it picks up where the Apocalypse Weird: The Red King left off. We find the survivors building a castle, and by that we mean fortifying their townhome condominium complex into a modern medieval structure! Holiday and Frank are struggling for control of the group and Ash rescues a special needs adults whose had a very strange adventure into a dark tomorrow within the Apocalypse Weird. We also join Braddock as he leads Task Force 19 on a mission to take a secret objective for the Tarragon Corporation and the mysterious Mr. Steele. Do you have a favourite character in the book, and if so, why? Hmmm… I like them all. I know little bit more than I’m ready to reveal about each of their back stories and so they have much more humanity to me than has been revealed to the reader. Some of them may seem to be very flawed individuals but I think we’re going to see over the course of the story that they’ve had to make some very difficult choices and some hard consequences. I think if I want the reader to ultimately take anything away from these books it’s not to judge anybody until you’ve walked a mile in their moccasins. I think I’ll become a major theme throughout the series. You have an adult special needs character in the book. It’s great to see that diversity, and the character and writing seems to have been well received in early reviews. What made you decide to take on the challenge of creating Cory? This character had been hanging out for a long time waiting to get in on the action. As always had a special place in my heart for these type of individuals and I don’t see them often enough and post apocalyptic fiction. Everybody sort of needs to be Joe superhero. But the truth is if we were to actually face some sort of civilization ending event they’re going to be a lot of people like this who are going to have to make their own way and I wanted to explore that. It was a challenge but it actually turned out to be a lot of fun. He’s actually been one of the most enjoyable characters to write. You also worked with Michael Bunker on Texocalypse Now. How was that collaboration? You know I just talked about that in a blog post over at NickColebooks.com. The short answer is it was wonderful and that’s because Michael Bunker and myself, while being very strong personalities, actually have very little ego. So that didn’t get in the way of us having fun in losing ourselves in telling a fun romp through a very strange tomorrow. It’s basically Mad Max meets The Walking Dead. A huge thank you to Nick for taking the time to answer my questions. The Red King and The Dark Knight (and four other Apocalypse Weird novels) are available now on Amazon. I highly recommend you check them out.